By far, the most influential Southern interior designer of all time is Chintz. Like Madonna, Mother Teresa and Gandhi, no surname is required. Born centuries ago, Chintz developed an immortality not mastered by even the most timeless guru, saint or rock icon. Chintz has been cordially invited into Southern homes for centuries. Like the life of the party, she strides boldly into any interior, and is capable of entirely changing the attitude, and immediately dictating the disposition of the space. Wood-blocked printed, painted or stained calico, Chintz was originally produced in India between 1600 and 1800, when millions of yards of the lovely and often vibrant floral and patterned fabrics were imported to England and France to great acclaim. However, Chintz’s wild popularity created a conflict from English Parliament to the Court of Versailles. Its use was banned in France in 1686 and in England in 1720 over concerns among European mills about the amount of Chintz being imported and their inability to produce it themselves. By 1759, the secrets to the chintz-making process were available to European mills, the ban was lifted, and the primary production of the fabric shifted to England and France. Southerner and President George Washington was responsible for bringing one of Southern interior design’s most famous players into popularity in America. Not only a revolutionary leader, he was trendier than we may think and was known to love the modern incarnations of Chintz, with her overall floral patterns, printed on both light backgrounds and some black backgrounds as well. Inspired by Chintz during his European travels, his architectural moniker Mount Vernon was decorated with the florals throughout. Architecturally significant, it was the interior design selections at Mount Vernon, and more specifically in The Chintz Room, known to be the finest bedchamber on the second floor, that set Chintz on a most successful path. Nearly always feminine in nature, Chintz has been known across the South as the girlie-girl’s go-to textile of choice when decorating or redecorating, or redecorating some more. That’s part of the beauty of Chintz. Her moods have more variations than the shades of the mood ring your mama wore in 1975. From the most subdued Old English florals to the vibrant colors of South Beach, Chintz is one lucky girl. She travels extensively and, like a chameleon, changes hue and tone to match the local environment; for inspired interior designers, she helps to actually change the local environment. Chintz’s passport has been stamped across the globe. However, nowhere does she feel more settled and comfortable than on breezy porches or in front of cozy fireplaces in homes across the southern United States. What is it about Chintz that makes her popularity so timeless? Some of the credit should go to her adaptability to any environment or time period; her colors and patterns are limitless. However, much of the credit should go to interior decorators, from homemakers selecting bed coverings and window dressings to famed interior designers like Dorothy Draper and Sister Parish. Draper’s 1948 redesign of the interiors at The Greenbrier in West Virginia and Sister Parish’s work at The White House, both dripping with Chintz, established a solid foundation for the modern incarnations. When considering the influence of Chintz on Southern interior design, it would be neglectful not to mention some of the most Southern of Southern interior designers, Julia and Suzanne Sugarbaker, Mary Jo Shively and Charlene Frazier. Without these characters from the late 1980s/early ’90s television show Designing Women, a great number of people (a.k.a. anyone without the benefit of Southern roots) would not have come to appreciate the idiosyncrasies of Southerners and their eccentric homes and lives—all with a healthy dose of Chintz. In fact, according to fabric industry statistics, sales of Chintz increased 63 percent across the entire United States during the run of the show. 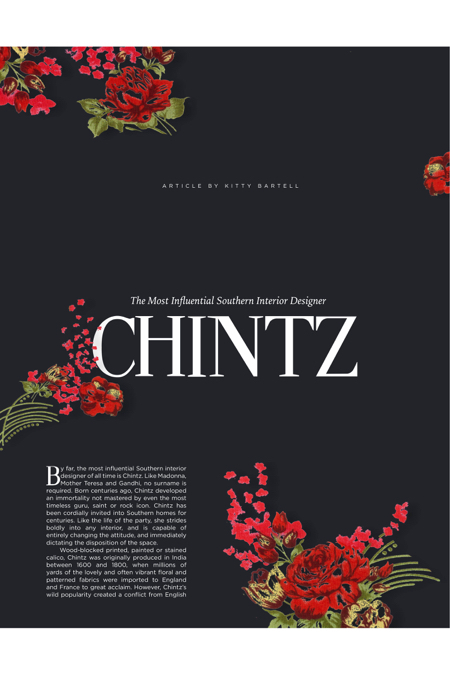 Chintz has made a real name for herself, hobnobbing with emperors, rubbing elbows with presidents, making her presence known over decades of history, and settling comfortably in the welcoming favor of the South; she’s not going anywhere. The life of the party, Chintz knows how to work a room, and like Madonna, Mother Teresa and Gandhi…she’s timeless.